Bail out now before the spoilers take control! Need to catch up first? Here’s our recap of last week’s season premiere. Surely this time they’ll convince their test subject to get rid of pennies! Burke believes in a very, very short leash. Their handler Agent Gary Burke (Jeremy Bobb) kept them on a ludicrously tight leash with very little opportunity to contribute, yet our detectives still managed to work out the killer was personally known to one of the victims. After ruling out a neo-reactionary monarchist ex-husband and a Chinese spy ex-boyfriend, Sherlock determines the brainwashing technology is insufficient to even convince someone to change stances on whether to discontinue the penny. In an echo of “The Hound of the Cancer Cells,” the true motive was reputational as our villain was ultimately revealed as a power-hungry politician. Overall, it’s an investigation that leave Joan and Sherlock desperately craving the freedom and respect of their former police partnerships. Like many, Sherlock reverts to sulky teenager in his father’s presence. Which neatly brings us to the offer from Morland Holmes (John Noble). Sherlock’s freshly-revealed father is far less manipulative or cruel than made out in past stories, and more like an emotionally-unexpressive parent struggling with how to best help his adult child suffering from addiction. Morland more prickly and condescending than sweet and cuddly, yet he’s polite enough to acknolwedge respect for the progress Sherlock has made and request permission before interfering in Sherlock’s life. Meanwhile, Sherlock degenerates to a hurt teenager in his father’s presence, throwing off unending yet not particularly clever insults in reaction to their painful history instead of the conversation happening in this moment. He realizes this later when debriefing Joan on his father’s offer to reunite the detective duo with the New York Police Department, struggling between past hurts and Morland’s seemingly-sincere generosity. Eventually, Sherlock ponders that this may be his father’s attempt at making amends, and that forgiveness may be healing to both of them. Joan wins at power plays with Morland, for now. Both our heroes continue their personal growth kicked off last episode. Sherlock conscientiously treats Joan as a partner, explicitly requesting her input on Morland’s offer. He even offered her an out of plausible deniability when he strayed past grey into outright illegal in his efforts to evade the investigation being smothered by the FBI’s bureaucratic tendencies, possibly out of guilt for her being tarnished by his relapse. 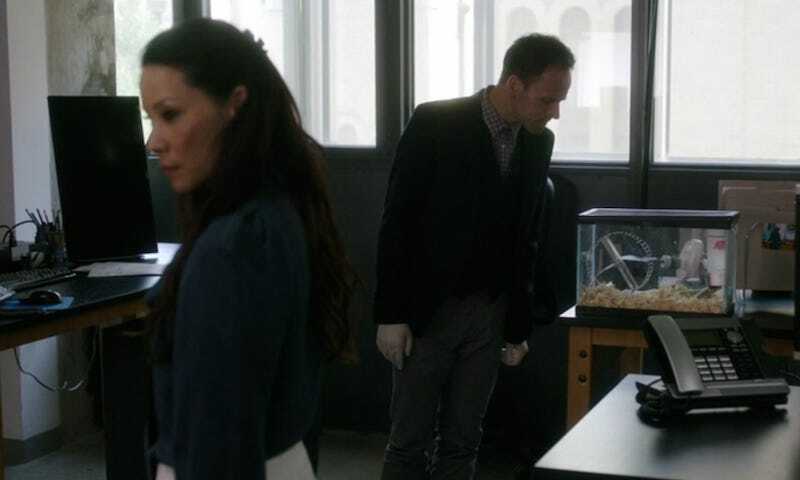 It’s no surprise to learn Morland is the one responsible for the District Attorney not charging Sherlock last episode (many of you guessed it in the comments! ), but it does appear he’s sincere in just wanting to get Sherlock reunited with his stable support network. Once Sherlock concedes he wants to return to the NYPD—not for managing his sobriety, but because it makes him happy—Joan allows Morland’s offer, but not without strings of her own. “If you’re going to be a part of Sherlock’s life again, I want to make one thing clear: I’m not gonna let you hurt him,” she threatened Morland, backed up by her revealing she has the wits and capacity to blackmail him if necessary. Is Morland earnest, or will his help come at a price? Will Sherlock and Joan reinstated with the NYPD soon, or are we in for another audition with yet another agency? How will Morland pull strings to get the pair reinstated, and will it come back to bite them later? And where’s Clyde?? Joan: “They don’t break a lot of national news in Trenton..
Clyde status: I’m starting to suspect a dire turtle-napping.